The 15-year-old had sought to enlist a sniper, who was actually an undercover FBI agent. A NEW JERSEY teen pleaded guilty yesterday to a plot allegedly inspired by the Islamic State group to kill Pope Francis during his 2015 visit to the United States. 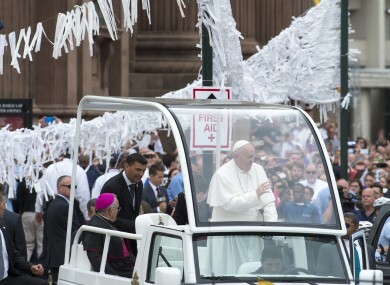 The US Justice Department said Santos Colon, 15-years-old at the time, sought to recruit a sniper to shoot the pope as he celebrated mass in Philadelphia on 27 September, 2015. Colon also allegedly planned to set off explosives. But the teen unwittingly recruited an undercover FBI agent for the job, and was arrested quietly 12 days before the event. “Colon engaged someone he believed would be the sniper, but in reality was an undercover FBI employee. Colon engaged in target reconnaissance with an FBI confidential source and instructed the source to purchase materials to make explosive devices,” the Justice Department said in a statement. Court documents said Colon sought to carry out the act in support of the Islamic State group and that he had used the adopted name Ahmad Shakoor. In a plea bargain with prosecutors, Colon, now 17, agreed to forego trial and plead guilty as an adult to one charge of providing material support to a terror group. With the deal, prosecutors dropped three other charges filed against him as a juvenile. Court documents said the charges were in relation to the Islamic State group, which Washington has designated a foreign terrorist organisation. But there were no details on how Colon became interested in the group and if or how he communicated with them. Colon’s home is in Lindenwold, New Jersey, just east of Philadelphia. Colon faces a maximum of 15 years in prison but sentencing would likely be held off until 2021 while he undergoes psychiatric treatment in a secure facility. In a plea statement, Colon acknowledged having been a patient in a mental institution in the past. Email “US teen 'inspired by IS' to plot assassination of Pope Francis pleads guilty”. Feedback on “US teen 'inspired by IS' to plot assassination of Pope Francis pleads guilty”.